The prices you will pay for gold bars vary depending on the current price of gold and can be one of the best investments you can make in your lifetime. The value of gold traditionally never fails to lessen with the passage of time and aside from that it has been used as a form of currency in order to buy products through the ages. These characteristics of this precious metal are one of the reasons why a lot of people and countries have turned their assets into gold and that is in gold bars. 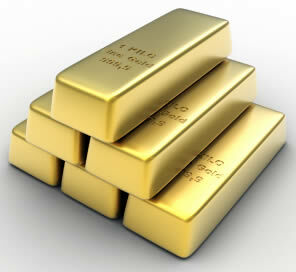 Gold bars also have a lower premium over their price which is why it is one of the best ways to buy gold in this form. The lack of additional expenditures for the design of gold bars makes it cheaper than buying them in forms of jewelries or coins. If storing wealth is what is in your mind, then a gold bar is the one that you should invest in. Gold bars come in a variety of available weights systems depending on the country on which it is being used. Some are expressed in grams, for those countries which have adopted the metric system as their units; ounces, for countries using English units such as the British and the American; taels, for countries using Chinese units; the tola, for those in the Arab countries and the Baht, Chi, and Don for Southeast Asian countries. The weight of these bars also comes in various forms. There is a one-kilogram bar, a one ounce bar, a ten-ounce bar, a quarter of an ounce, half an ounce, and also a tenth of an ounce bar which is considered to be the smallest gold bar of all. They are measured in troy ounces which has an equivalent weight of 31.1 grams in the metric system. The price of a gold bar is determined by the spot price of gold for the day. This price, which is changing almost every hour, is affected by the performance of gold in the market. Up to the time of the writing of this article, the bar price has been $1, 741.38 for a one-ounce bar, $17, 496.36 for a 10-ounce bar, and $55, 454.8 for one kilogram of gold bar. Some of the factors which determines the price of a gold bar are government taxes, insurance, shipping, manufacturing costs, the premium cost of gold, and of course the profit margin for the seller. Some of the known manufacturers of these bars are the subsidiaries of the Union Bank of Switzerland and Credit Suisse and the PAMP SA. These have all been manufacturers of gold bars for years now. If you are trying to make an investment in gold, it is better if you can buy the larger types of gold bars as you get to pay only smaller amounts of other expenses for them such as shipping and handling. The price of gold bars has seen some significant increase during the past few months which is a good indication that it is one of the better investments for those who would like to secure their hard-earned cash.